Sam Smith performs onstage during the CBS Radio presents 5th Annual "We Can Survive" concert held at the Hollywood Bowl on Oct. 21, 2017, in Hollywood, California. 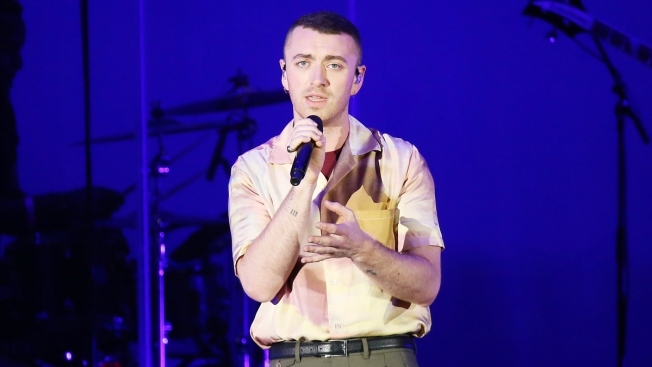 Days before the release of his highly anticipated sophomore album, "Thrill of It All," Sam Smith is giving fans a rare glimpse into the person he is today and the person he was. In a candid interview with The Sunday Times, the moody singer opened up to writer Louis Wise about his sexuality, his gender and how he loves to rock a pair of heels. When asked about why it took him so long to come out, the 25-year-old "Stay With Me" singer said, "Looking back on it, it was the fear of saying the wrong thing and offending." "And I was 19 when I started writing the first album. I'd just moved to London from a village--I was literally the only gay in the village. I didn't know what I wanted to say," Smith continued. The now openly gay Grammy winner is using his experience for his music, explaining that his song "Him" is about a son coming out to his father. Of his new songs, the big-voiced singer said, "I think they show my growth, my confidence. I feel like they show me. They show the gay guy I've become." "I love a heel," he said. "I've got loads of heels at home." But his love of clothing isn't something that sprung from his fame, it's been a passion of the singer's for years. "People don't know this, but when I was 17, I remember becoming obsessed with Boy George and Marilyn [Monroe], and all that. There was one moment in my life where I didn't own a piece of male clothing, really. I would wear full make-up every day in school, eyelashes, leggings with Dr. Martens and huge fur coats, for 2.5 years." When the writer asked if he feels like a cisgender man (cisgender is a term for people whose gender identity matches the gender that they were assigned at birth), he flashed two Venus symbol tattoos and said, "No. I mean, I've got these tattoos on my fingers." He added, "I don't know what the title would be, but I feel just as much woman as I am man." The Oscar-winning singer also admitted he spent a year at the local bars drowning his break-up sorrows but has taken a break from drinking. "Last year...I'd say the entire year, I went out too much, I started drinking way too much and I started smoking cigarettes, stupidly. And I lost a little bit of control towards the end. I haven't drunk now in 2.5 months." He also says it's just a break, he isn't laying off alcohol forever. "I will drink again--it wasn't 'A Drinking Problem.'" But he also says he has had to realize that he has "an addictive personality". So he put a lid on it. "I was just going out too much." In the interview he also said he has no boyfriend, however, the singer has been photographed with "13 Reasons Why" star Brandon Flynn as of late. "The Thrill of It All" drops on Nov. 3.